‘You can observe a lot by just watching.’ Yogi Berra. | Sally says . . . eat, sleep, work, read, play, draw, bark . . .
← ‘When witches go riding, and black cats are seen, the moon laughs and whispers, ’tis near halloween.’ Author Unknown. ‘You can observe a lot by just watching.’ Yogi Berra. I have been really slack with my sketching over the last couple of weeks. I know. I seem to be saying that a lot lately, don’t I? But it’s a constant struggle and I am still not really sure why. I did great for a while, sketching (almost) every day. Even if it wasn’t much of a sketch, at least I was picking up the pen and doodling a bit. But lately days and days go by without even an attempt. Sometimes I pick up my sketchbook and flick through it, thinking it will inspire me . . . and sometimes it does, but often it doesn’t. Oh, I have all sorts of excuses (I’m too tired after work . . . I don’t have enough time today . . . I really need to finish sorting that other thing out first . . . and that old chestnut—I can’t find anything interesting to draw) but I know they are only excuses. I have heard (made) them all before. I am in the drawing doldrums. Again . . . But I am trying to see it for what it is and trying not to get down on myself about it. I reckon I just have to get into a bit of a rhythm again and I will be fine. And, you know, it’s not all bad. One thing I have come to realise is that since I took up sketching again earlier this year (even if somewhat sporadically) I have definitely become more observant. It’s not like I wandered about looking down at my feet all the time, because I didn’t. I still noticed my surroundings—the houses, the water, the river, the birds—but now I find myself really seeing things in a different light—the way the branches of a certain tree hang over right down into the water along by the riverwalk . . . the ‘sticky things’ growing up through the mangroves . . . the ricketty old verandah on the house on the corner. (Has that always been there? How have I never noticed that before?) It’s surprising to me—and, to be honest, a little bit freaky. It makes me feel like I have been walking around in a bit of a fog for years . . . So really, all I have to do now is work out a way to transfer those new-found observations onto the pages of my sketchbook . . . on a regular basis . . . and I’ll be set! Right? 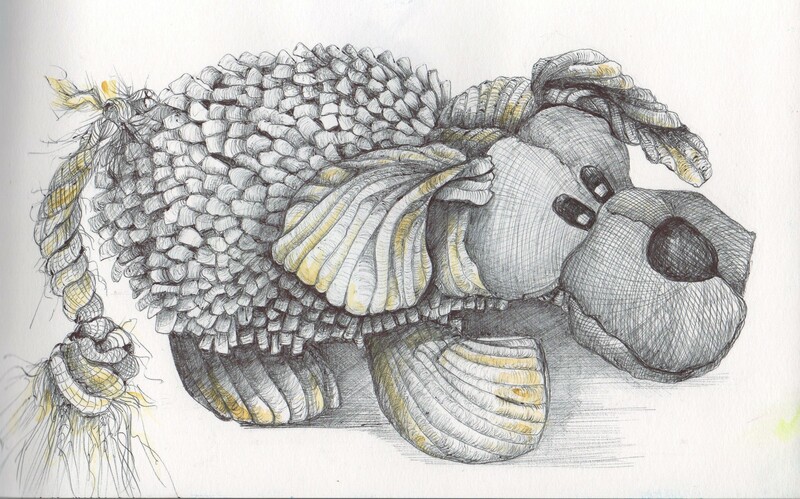 This is a sketch of one of Maudie’s favourite toys. —along with, shall we say, some rather ‘exotic’ smells . . . Yes, I do see where you are going – the price of being a creative perfectionist – or a perfect creationist? See you next week, but in the meantime enjoy the weekend doing …… whatever! If you want some gratuitous advice Sal (and even if you don’t 🙂 ) I think you are putting too much pressure on yourself to come up with the “outputs”. You are doing this for fun, right? So sketch if you feel like it, and don’t sketch if you’re not in the mood, or can’t be bothered, or you don’t have any inspiration …… or whatever. Maybe this is an over-simplified male view of things, but that’s how I would approach it. I have had a relatively lazy day at home today, despite the squillions of things that “need to be done”, but I won’t be drifting off to sleep tonight feeling at all guilty about that. You are right. I do feel pressured to sketch – but not because I feel I should – I really do want to. I love sketching when I really get into it. The pressure comes in with always wanting the final product to be good, and being cross and disappointed with myself when it isn’t. And that is what I need to get past. And I can’t get past that unless I continue to draw. And I can’t draw because I am still too focussed on the outcome. See where I am going with this? Sigh . . . .
You have a profound insight into your ‘doldrums’ Sally, which I admire greatly. Your sketch actually embodies the “exotic” smells attendant to Maudie’s toy. Well done!